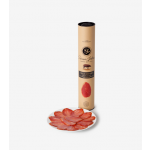 This cured loin handcrafted in Jabugo, and wrapped in an elegant cylindical package, is one of the most appreciated and valuable cuts among Iberian acorn-fed ham lovers. Derived from a section of the lower back or lumbar muscle of the animal, it's known to have a powerful and fragrant aroma, a faint garnet and ash color and a defined sheen. 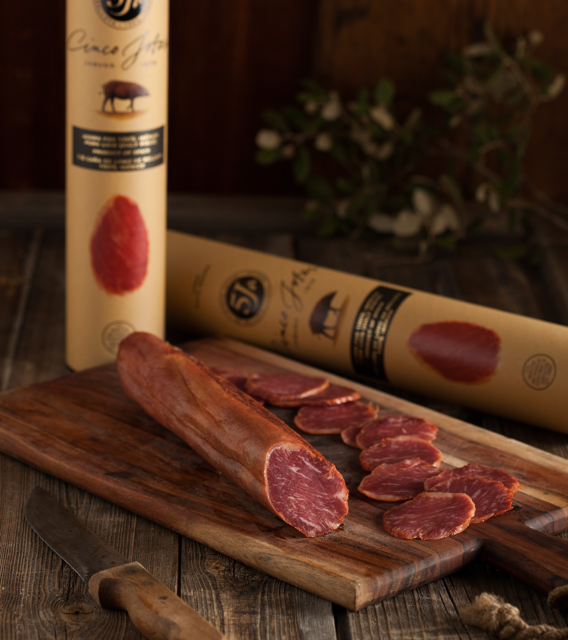 Aficionados of ibérico products appreciate its peppery and smoky flavor that lingers on the palate. 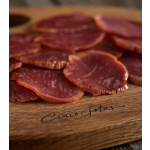 Cinco Jotas acorn-fed 100% ibérico loin is one of the Spanish gastronomic references, a true pleasure dome for any gourmet palate. Here's what you need to carve your Iberian loin: a cold meat-cutting board and a proper carving knife with a sharpener. Using a very sharp knife, carefully carve the loin into paper-thin slices to fully appreciate the texture and flavor. Lomo is an Iberian cured delicacy extracted from the back of the pig. This cylindrical piece is free from external fat, and is considered one fo the most valuable and appreciated cuts from the animal. Fino or Manzanilla sherries are a good companion for this rich cured delicacy due to their capacity of balancing flavors and cleansing the palate between mouthfuls. We recommend the luxury of loin during the appetizer course, always carving in translucent, paper-thin slices to fully appreciate its unique qualities. Exclusive slices elegantly displayed will be the hightlight of any meal. The vast majority of Iberian ham breeders work with mixed-breed Iberian pigs, generally a mix of purebred with a European breed. They are selected due to their high yield, however the flavors and aromas are different from 100% iberian pigs. 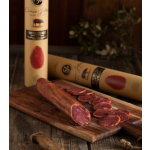 Cinco Jotas has a long and distinguished history of only chosing purebred 100% ibérico pigs. The brand relies on an extended team of veterinarians and experts in animal husbandry who are dedicated exclusively to the study, care and control of 100% ibérico pigs, ensuring protection of the breed and the highest quality of the product.